Magazine illustration dates to a period when women’s suffrage and socialism were commingling in productive new ways. Here, Braverman's image perhaps redeploys American Association for the Study and Prevention of Infant Mortality--that is, simply thinking of children as "the nation's chief asset" in terms of health was limited. 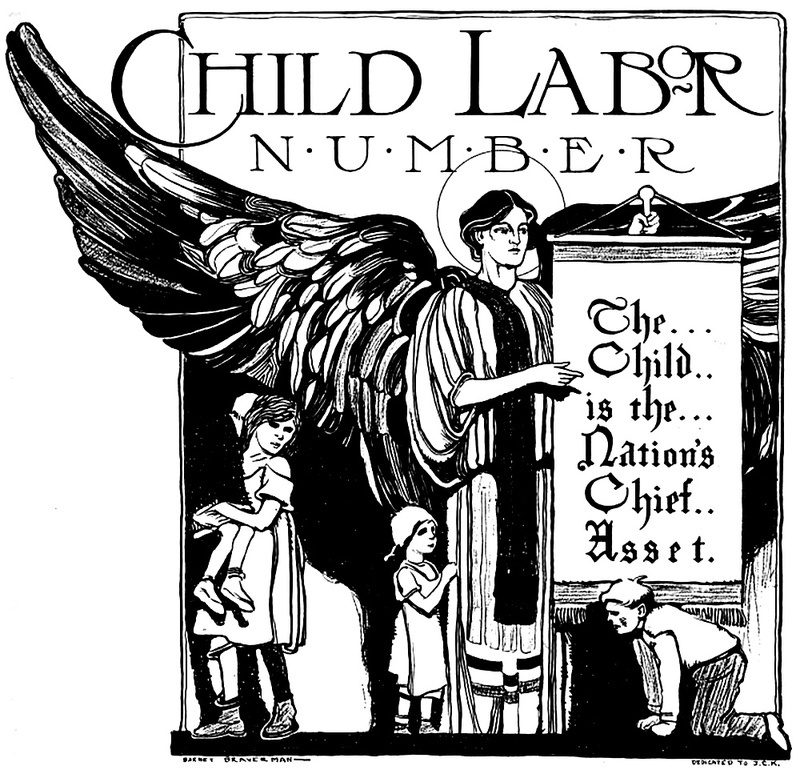 The wings of allegorical figure also protects children from economic exploitation. At the time of this illustration Braverman’s job title was “Associate Editor and Circulation Manager” for The Progressive Woman in Chicago; he also produced much of the magazine’s art. It was founded as The Socialist Woman in 1907 by Josephine Conger-Kaneko and in 1913 would become The Coming Nation before folding in 1914. After passage of the Nineteenth Amendment in 1920, and as socialist unity fragmented under the duress of Palmer Raids and systematic anti-red legislation, Braverman became disillusioned and moved into poster art and advertising. By the 1920s he worked for the Curtis Company agency in Detroit, MI and then the Hamman group in Oakland, CA. He played a central role in smuggling copies of James Joyce’s banned novel Ulysses into America in 1922. Later Braverman created works for the Federal Art Project, including a work held by the New Deal Gallery at Mt. Morris: . He had a great interest in films, during the 1940s working upon an authorized biography of the director D.W. Griffith that never was published. He lived the last years of his life in St. Paul, MN. "The Progressive Woman" 7.72-73 (June-July 1913): cover. Braverman, Barnet (1888-1965), “Child Labor,” OpenValley, accessed April 24, 2019, https://openvalley.org/items/show/918.